There are three options for reproductions and the price varies depending on the option you choose. Please note that this is not a hard-cover book. 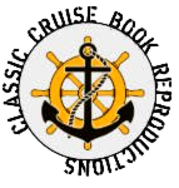 1) CD or DVD Copy: The cruise book will be scanned (color where applicable) and a digital copy of each page will be provided on the CD. This version can be used in a slideshow if desired. 2) Hard Bound Copy: The cruise book will be scanned (color where applicable), printed, collated and bound with plastic see through covers and a black plastic comb. To inquire into the availability and free estimate of a cruise book, please fill out the request form to the right. Also, if you can locate your own book, which is not on our list and through another individual, we would be willing to scan it in (you or the donor would have to send it to us) and we would give the donor a free CD copy and you a reduced price on your copy. Remember, when filling out the request, please include the ship name, year, and option number you would like in the details section. Once we receive your request we will check our resources and respond to you via email or phone within 24-48 hours. The normal turnaround time for a reproduction is 10-14 business days after receiving payment. If you have any trouble sending in a request, simply send us an email to shipmatememories@gmail.com or call (703) 897-4737.